Musik Express is giving away 3 copies of 'Trilogy' on Blu-ray. Not sure if this is only open to those in Germany or not. From Nola.com: Did you hear that the Voodoo Music + Arts Experience has added The Cure to the line-up? Anselmo: I saw that. I’m a big fan, man. I love The Cure. Do you really? I didn’t think you’d be as excited as everyone else seems to be. Anselmo: I’m an older Cure fan. “Seventeen Seconds” (from 1980) and “Faith” (from 1981) are my two favorite Cure albums. Robert Smith is just a greater songwriter, period. It’s a beautiful addition to the Voodoo Fest. Big, big thumbs-up right there. So if you’re in town the first weekend of November, you’ll be there? Anselmo: I might be in town, I might not. I have a gig in South America. I wish I could tell you more about it. It’s kind of like the thing I do with the Metal Masters; it’s an all-star cast. But hopefully I’m home. 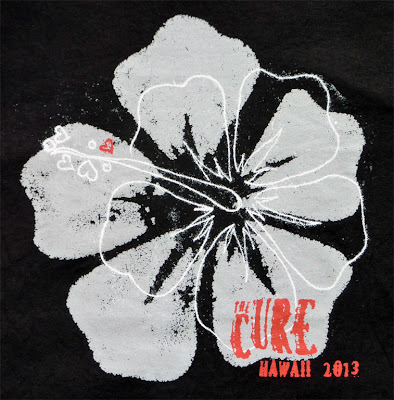 Because I’d love to see The Cure. Thanks to Olivier at It's a Perfect Day, here are some better shots of that special Cure Hawaii shirt. "Every city in America has at least one Gothic club. In New Orleans, it's the Blue Crystal. When a band like the Cure is in town, the Blue Crystal throws a party after the show. The club called Reznor, the closest thing they have to a local dignitary, to invite him to the Cure after-show party. Further conversation revealed that the only way the Cure would show is if Reznor is there, too. You can't hear it anywhere in Nine Inch Nails, but Reznor is a Cure fan from way back. 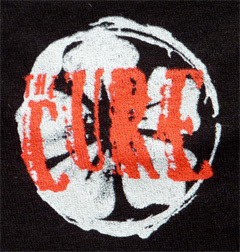 He considers the Cure's The Head On The Door" one of the best records ever." His favorite description of himself: "Robert Smith with a head cold." "I end up going to the club, and surprisingly, everyone from the Cure is there. And the bartender calls me over and says, 'Robert really wants to talk to you.'" Reznor smiles, makes a face that says: You mean I have to meet one of my teen idols in a goth club in Louisiana? Now? In front of all these people? "It ends up," Reznor says, "me and him, hugging on the dance floor. He's like, 'I love you, dude,' and I'm like, 'I love you too, man.'" The Cure fans formed a loose circle around the pair while New Order's "Blue Monday" pumped out of the speakers. 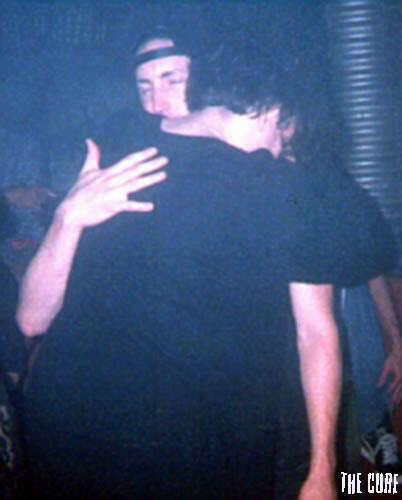 "It was the greatest scene," Reznor says. "We were both fairly incoherent," he feels compelled to add." My bad cell phone video of WWL's announcement of The Cure at Voodoo on tonight's 6PM newscast in New Orleans.